Church flower stands are more interesting with different varieties of greens. 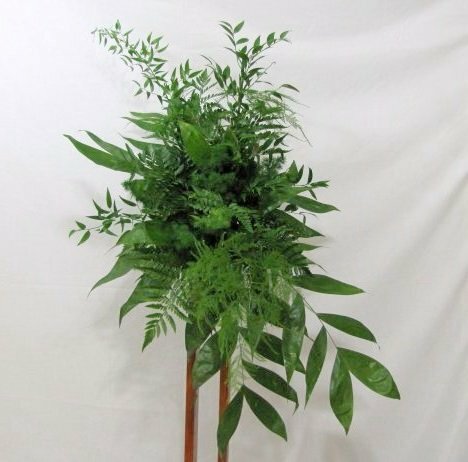 I'm going to add another feathery fern to this church wedding stand. 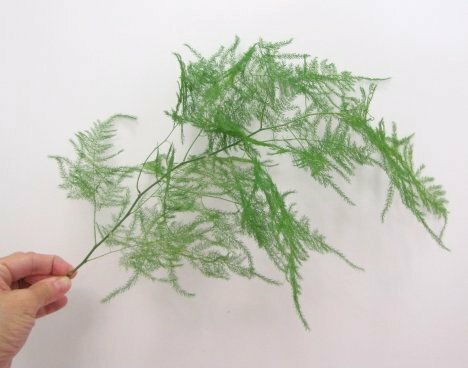 Plumosa (also commonly referred to as asparagus fern) is a feathery draping green with graceful lines that adds an airy touch to your arrangements. 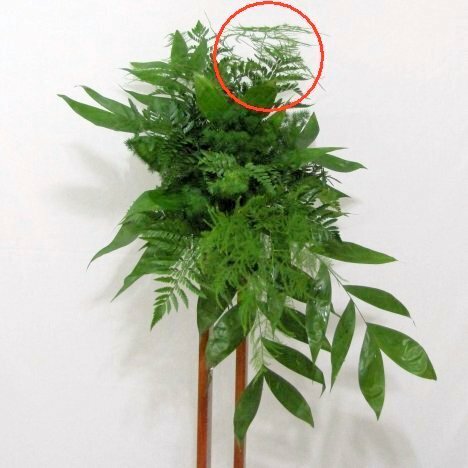 I commonly add this fern in smaller fronds to boutonnieres and corsages. The long stems work well for adding to large arrangements. A single bunch of plumosa can contain up to 30 stems - so you get a lot for very little money. 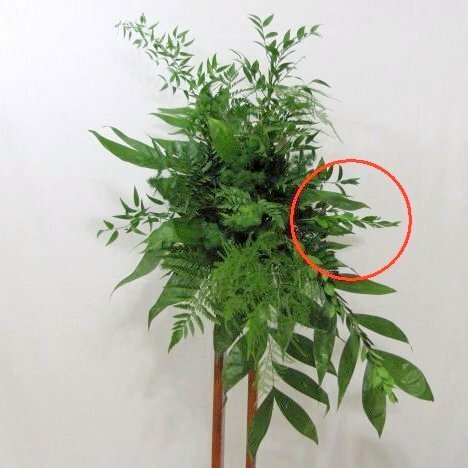 You can see I simply added two stems, one at the lower left of the stand and one in the upper right. I want to make this church wedding stand more interesting by adding the drama of long lines. 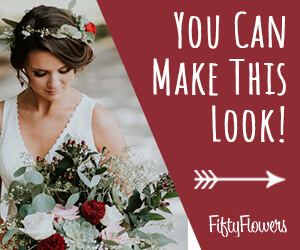 I love two different kinds of greenery that are perfect for this - italian ruscus and myrtle. 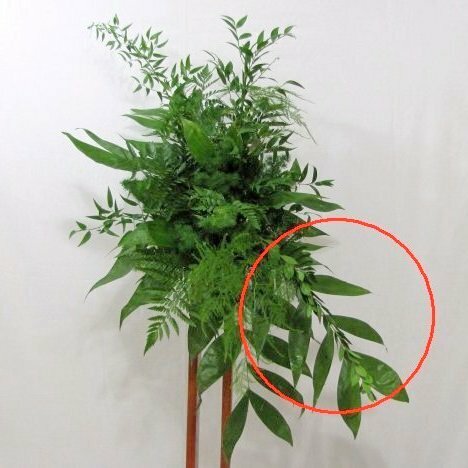 Please be careful to cut this type of greenery with a sharp knife or bunch cutters. The woody stem is tough to cut and regular household scissors can slip, accidentally cutting fingers along with branches! Ruscus is a favorite of mine. 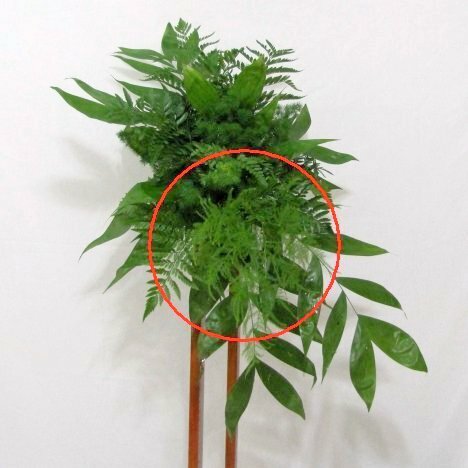 It has a unusual look, with narrower leaves and a slightly more bushy feel. 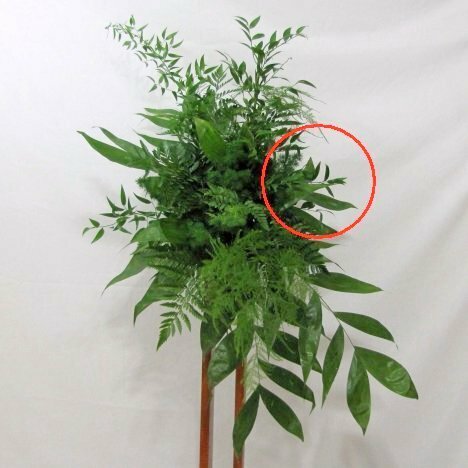 Save some of these shorter laterals of the ruscus to add later into bouquets or corsages if you wish. 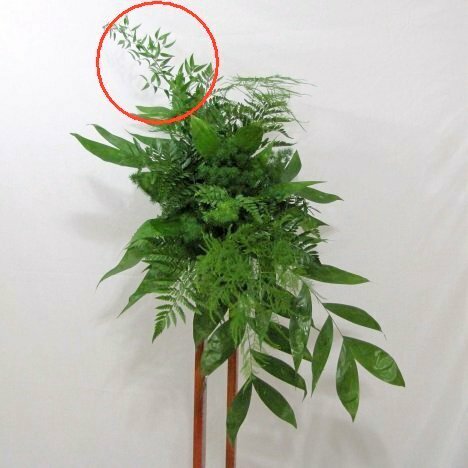 Again, let the long graceful lines of the greenery fill out the empty spaces, giving more length the the final design. Add to the top, sides and bottom of the design, opening up the width and length even more. 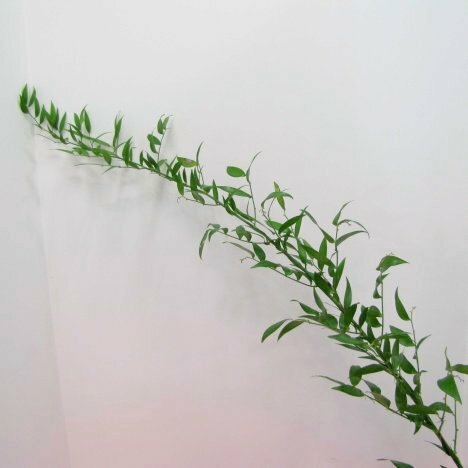 Cut ruscus to length, keeping it slightly shorter on the sides for a more elongated (rather than round) look to the spray. Adding myrtle to this church wedding stand gives more length plus a great scent. Myrtle is highly prized by florists because it has a pleasing spicy scent when freshly cut. Myrtle is packed by weight, with usually four or five long leafy branches to a bunch. Add the myrtle to the top and bottom , angled outwards. 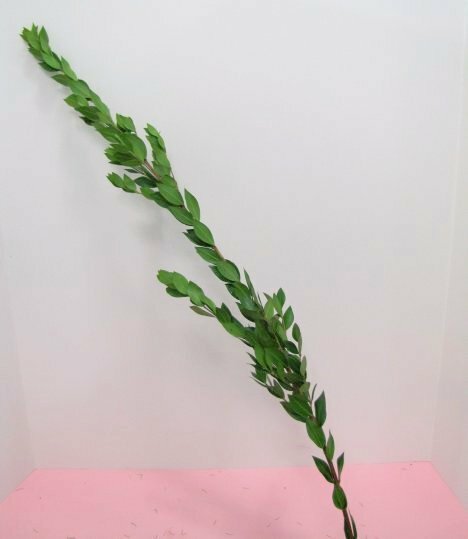 If you want to add to the sides of the arrangement, cut the branches shorter to keep the elongated look. I generally wait to add my flowers to the wedding stand after arriving at the church. If you don't have time to do this, you can flower before you go to the venue. 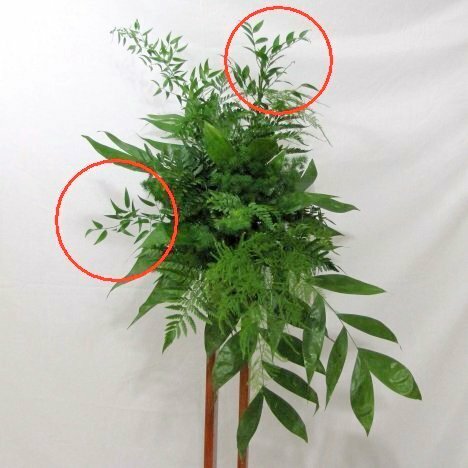 Just realize that you need to be extra careful in delivering already flowered arrangements to the church because the long laterals can be easily broken during transport. 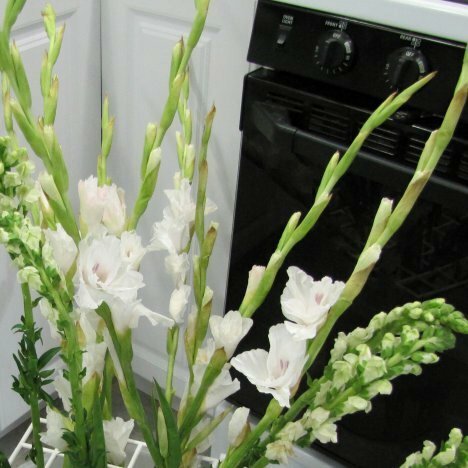 I've now going to add gladiolus to the arrangement. When in season, they are generally inexpensive compared to other flowers.